Paul Pogba is reportedly prepared to sign a new long-term contract with Manchester United following his bright form under caretaker boss Ole Gunnar Solskjaer. The Frenchman struggled for regular gametime under Jose Mourinho earlier in the campaign but the Portuguese's sacking has brought about a change in fortunes. According to The Sun, the midfielder is now keen on holding contract discussions with the Mancunian giants with his existing deal due to expire at the end of the 2020/21 season. It is added that the Frenchman is likely to demand a significant rise on his current £290,000-a-week wages to put him level with Alexis Sanchez as the highest earners at Old Trafford. 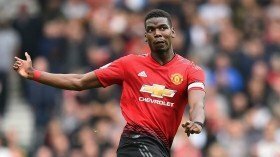 Pogba endured a difficult run of form between September and November but he has still amassed 10 goals and eight assists for the club across all competitions this term. The Frenchman is expected to feature from the off for United on Friday night where they are scheduled to face Arsenal on the road in the FA Cup fourth round.